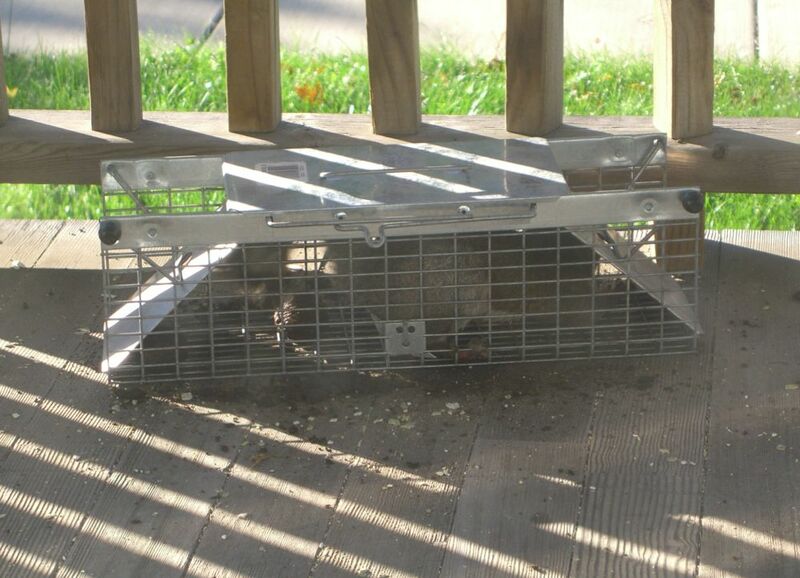 Looks like he scraped himself up on the trap or before getting in. 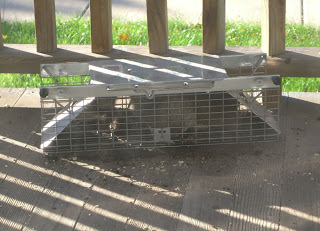 Released him in the woods and, a few hours later, did the same with his partner in crime (who may have been attracted to the trap by the first one’s scent for all I know). Even though I’d only seeing these two wandering around, I reset the trap and left it out that evening. Came home to find a young raccoon inside, and a very anxious mother prowling around. Despite the youngster’s whining, I let everything sit overnight – raccoon mothers are notoriously protective and I wasn’t certain I could scare it off long enough to release the kid. Come morning though, mom was nowhere to be seen and the young one was half asleep in the cage. Open it up, tap the back end a few times, it finally lumbers off – under the shed. Time for some cayenne pepper I think. Was just sitting in my dining room when something in my semi-dark living room caught my eye. Turns out it was a bat. A bat flying about my living room, trying to get out. When/how it got into the house, I have no idea. Fortunately a quick dash around to the front door and it flew itself straight out. This time of year, apparently all it takes is two walnuts and a squirrel will squeeze itself into a space barely larger than itself (there were no mid-size traps available at Lowes). I put it out last night as the sun was heading down and when I got up half an hour ago, I found… success! Just released the critter into the arb. He was healthy enough to scoot from the trap to a tree 20 feet away in about .003 seconds, so I think he’ll be fine. Now to fully patch that hole in the porch eave so this doesn’t happen again. This task will be made much easier, I hope, by the fact that I FINALLY bought a jigsaw. After several trips to Jamie’s without stumbling across a solid one for cheap, I caved and decided that fixing the eave, building a vent slot for the laundry room, etc, etc were more important than bargin hunting. I may have failed flea marketers everywhere, but at least my house will not have unnecessary holes in it this winter. Also done yesterday – ordered the shed, put up the second light in the hallway (thank you again, wire clippers!) and… something. I must have done something else yesterday. I need to keep two lists – things to do and things I’ve done. Yes, I realize this blog was supposed to be the latter.